Before Weapons of Mass Destruction, American soliders faced a different type of war-time casualty: venereal disease. While we remember the posters of Uncle Sam declaring "I Want You to Join the U.S. Army", the Army was also concerned that their potential recruits were clean. 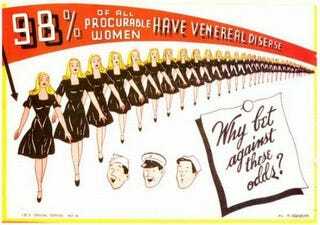 Enter this collection of propaganda from the era courtesy Buzzfeed, which boasts incorrect statistics such as "98% of all procurable women have venereal disease" and phrases like "she may look clean, but you can't beat the Axis if you get VD."